Good alignment in the front. Nice gap between the spinner and cowl.. I laid out the lines for splitting the cowl and where the exhaust pipes would go. 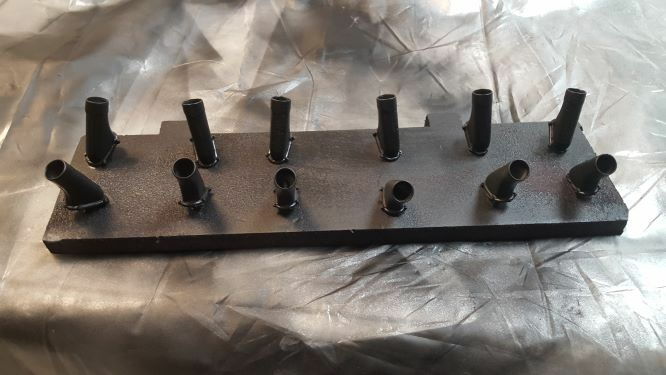 I'm trying the Prekin scale exhaust manifold. It's better than what the kit came with. I really wanted a functional exhaust but Kaleo changed hands and I couldn't get one. Too late now. I also drilled out each exhaust about 1/4". 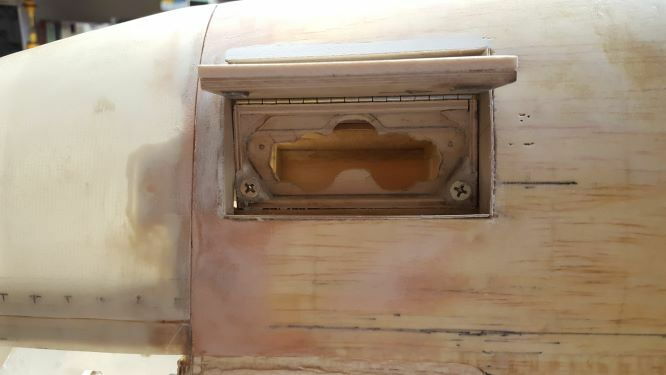 I'm not sure it will do much good, but having them open to the cowl might pass some air through this area and help cool the engine. Every little bit helps. I made sure these stacks would fit. I painted the stacks flat black. 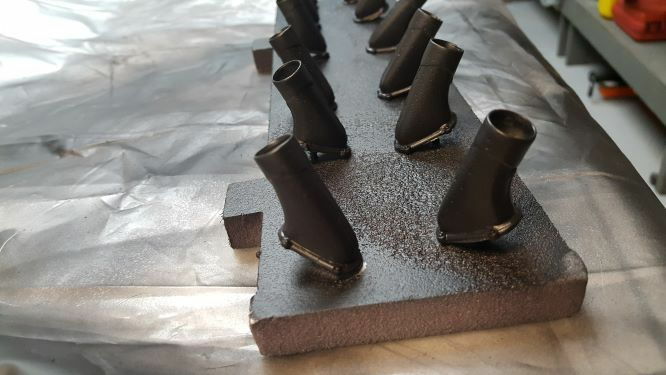 I'll add some silver / white to the tips later to simulate heat scorching. I painted the cover metallic silver. 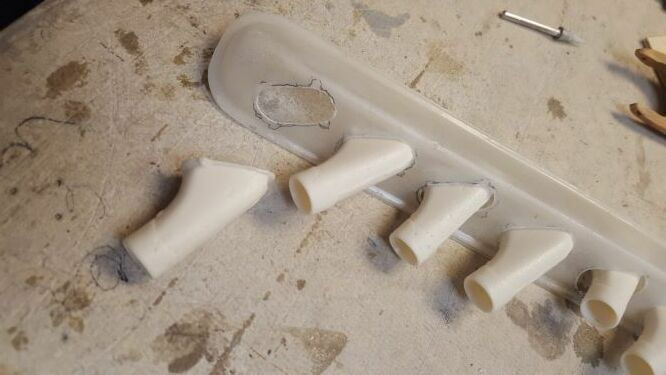 I prepped these plastic parts with a Dupi-color adhesion primer first and then painted them. I had already tested the best glassing techniques. The Z-Poxy system works the best and is the lightest. 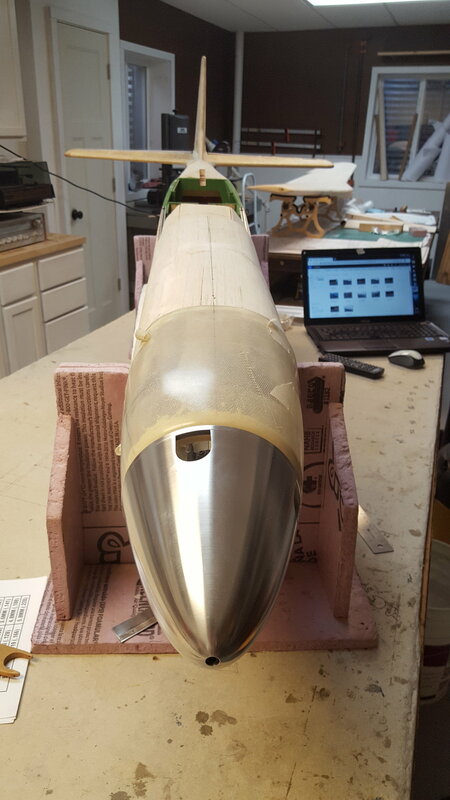 I'm using .47 oz for the fuselage. It went on quickly. It took about 2 hours to do front and back for the first pass. 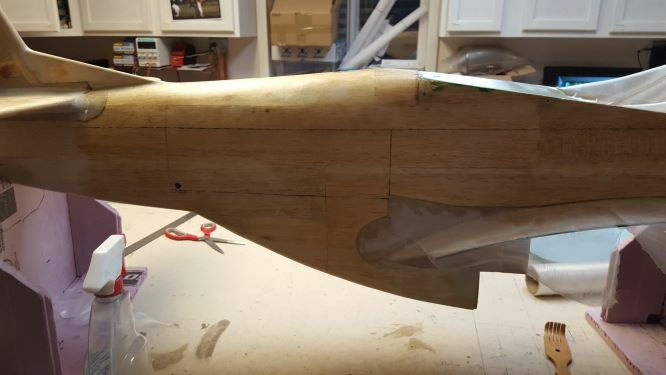 This is about 90% of the fuselage. 1. I measured out the cloth size needed and laid masking tape down. Then I cut the tape down the middle with scissors. 2. I laid the glass over the fuse and smoothed it out. 4. I poured and bushed on the epoxy quickly. I ended up brushing on most of it. 5. After the brushing, I used paper blue shop towels to sop up the excess. This keeps the weight down. 6. When dry and after sanding and cutting off excess glass, I'll finish the second coat tomorrow. I'll still have to glass some small areas on the bottom where it didn't wrap all the way. 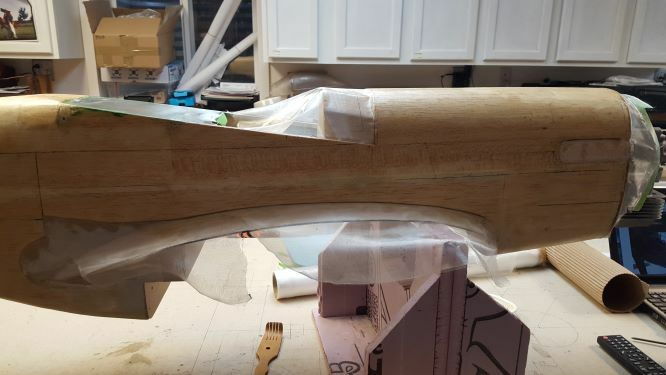 I'll trim up to the fairings. This will make a nice hard surface for the aluminum skin. 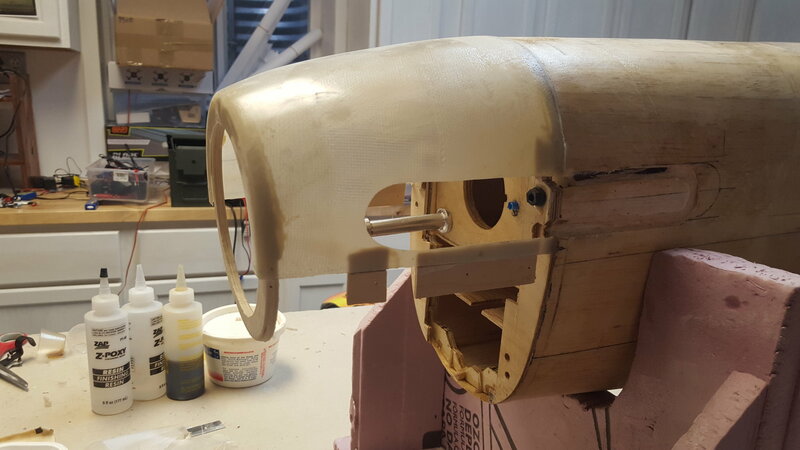 The cowl was reinforced with plywood at the split. 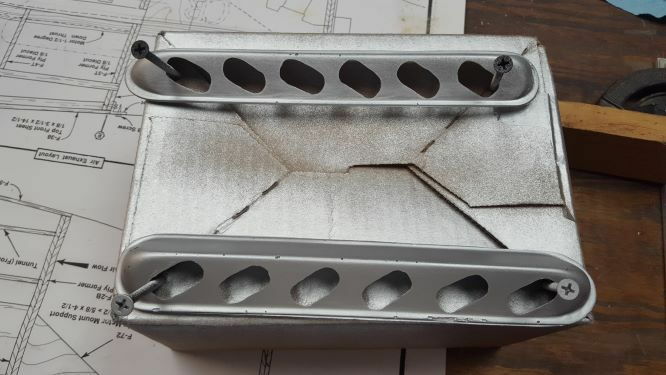 Small #0 sheet metal screws will be used along the sides to help hold the shape. 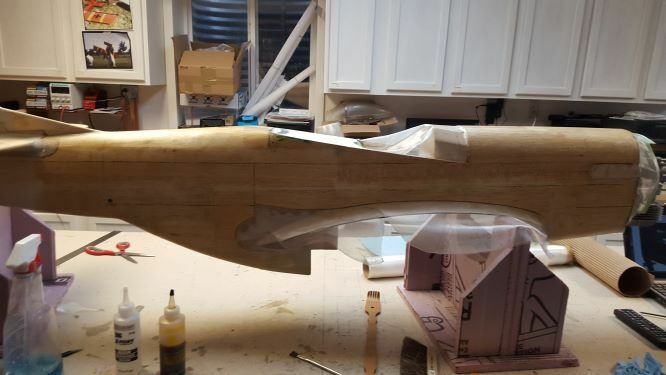 The top is epoxied in place. 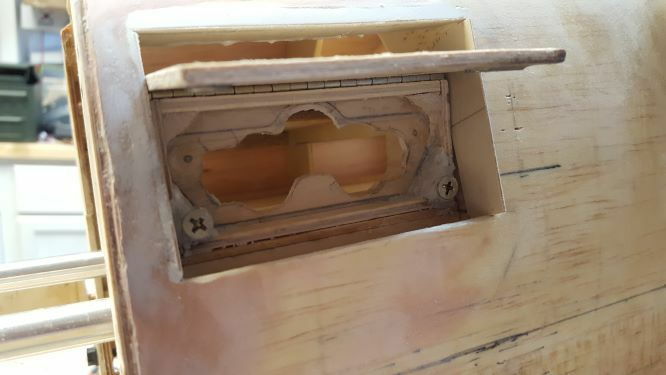 Four nylon screws will also hold the bottom against the firewall. The cowl doesn't fit even with the fuse by 1/16" in places. 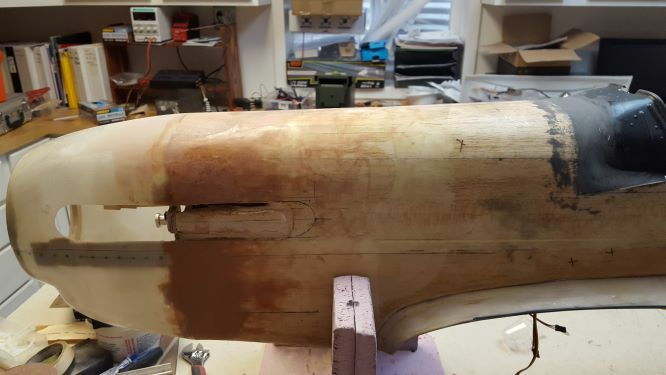 The whole top and sides of the fuselage will have to be blended from the cowl aft to the cockpit shroud to form a smooth shape. 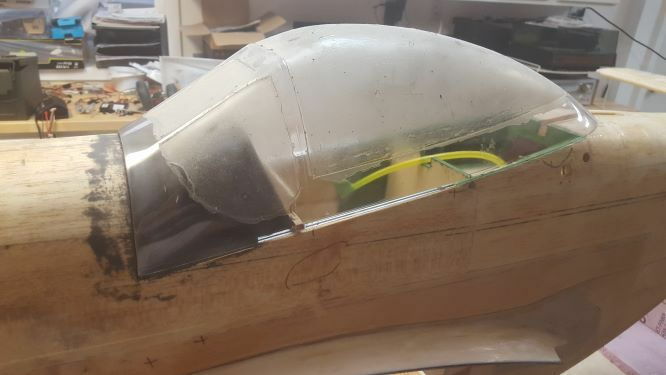 Fitting the cowl, exhaust and the and the shroud are build steps that allows the whole front end of the fuselage to be finished. 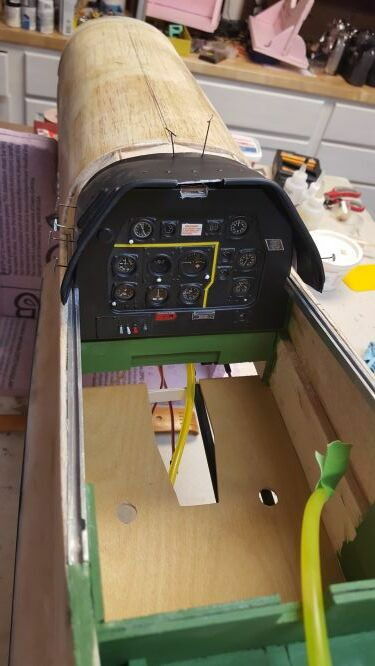 I had to install instrument panel in order to install the shroud. I caught this on another thread. 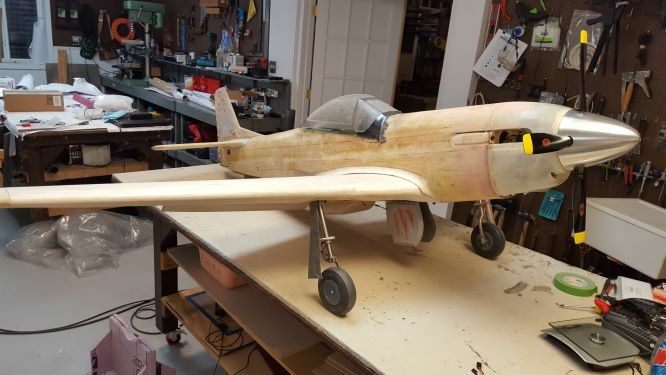 It goes on a little more like peanut butter than another epoxy filler I used. 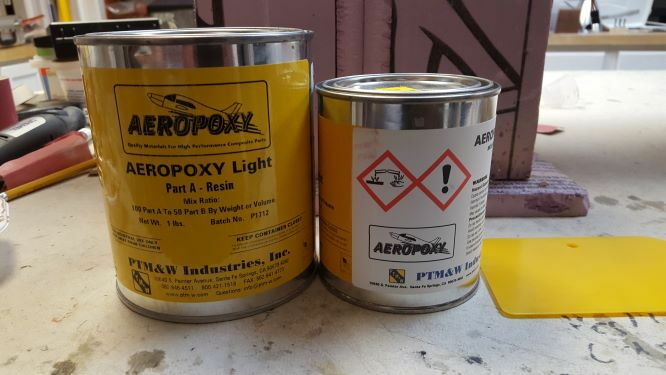 It is lightweight epoxy .49 g/ cm^3. It sands well and can be smoothed out using alcohol with your finger to reduce the sanding required later. I built up the front in several coats to finish the front. I'll have to add more to later after the canopy is installed. The shroud area was epoxy filler with black pigment. I still thought best to paint it after sanding. 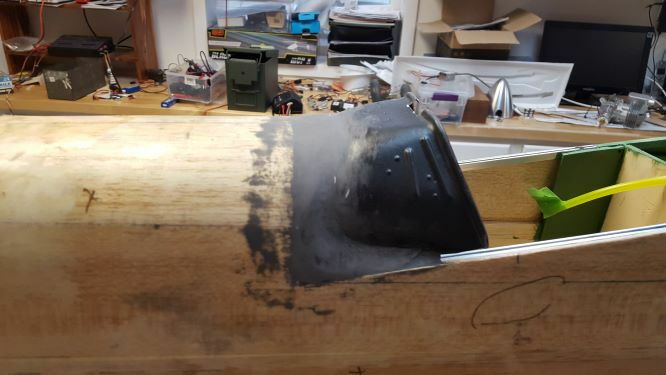 I started fitting the canopy. 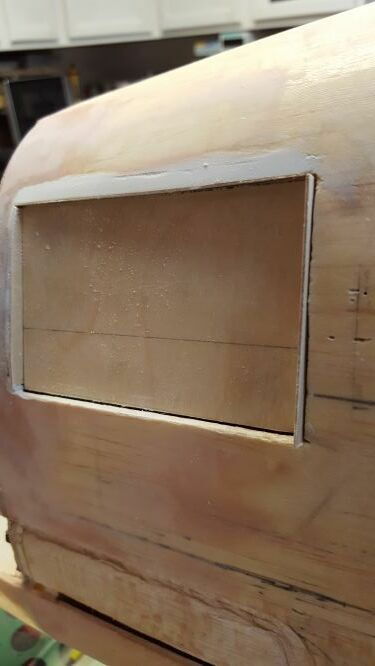 I cut a groove along the front edge. I'll blend this forward after it is installed. The canopy had a curled edge that fit into the groove. 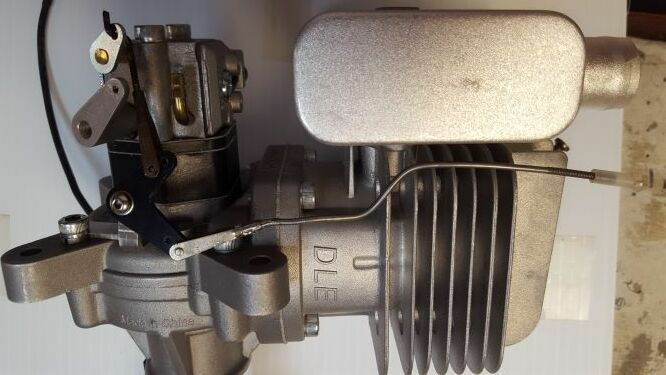 OK, the logic is that I need to pick a spot in the fuselage where I can place my dual charging switch. I'm putting in redundant LIFE batteries. I also have to put in a 7.4 V Lipo battery for the retracts. But before I pick a spot, I thought it best to see where the CG is at this point in the build. The Super Tigre 3000 in the RCM article is about 42 oz. and I'm at about 55 oz. with the DLE 55RA. They added a pound of lead to balance. How they got to 21 lbs. is a mystery to me. 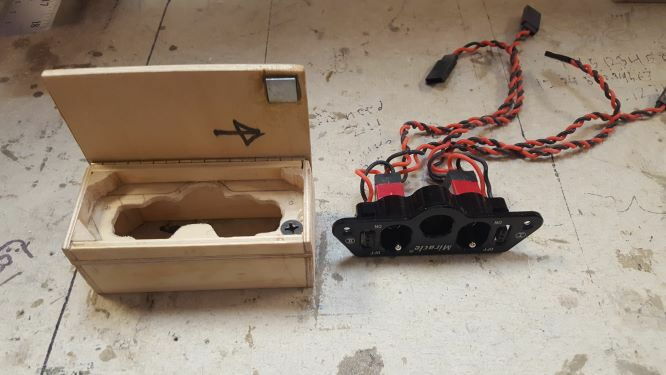 I'd like to put the batteries near the switch because it makes no sense putting batteries toward the tail if I have to add a pound of lead in the nose to offset the batteries. 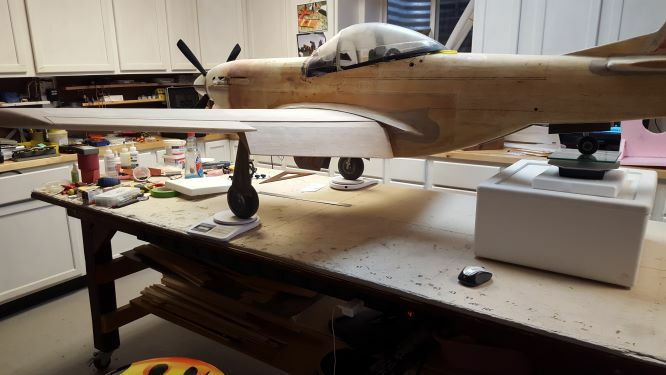 Sooooo, I decided to take some time and assemble the plane as much as possible and make some CG estimates. 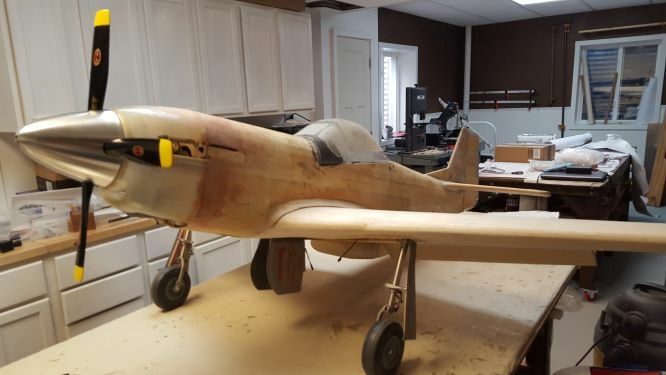 The plane is weighing about 25.3 lbs. right now. Looks like I'll be over my target weight. Calculations are telling me I still need to move the CG another 36 mm forward. The scales are telling me I need a lot more weight up front. That's where the switch and batteries will go. 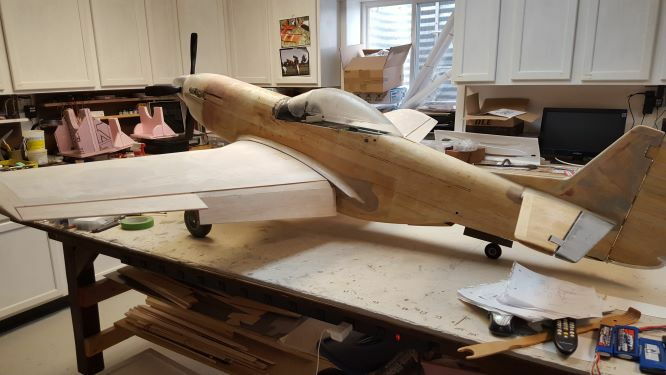 Starting to look like an airplane! I had already determined that I wanted the switch up front near the batteries. I searched the internet for ideas on making a hatch. I found some good ones by expert builders, but one concept offered was a rotating door using a wire and a tube for a hinge. It was a simple concept where you’d push on the bottom (or top) of the door, and because it was offset, the door would rotate open. I liked that idea. I implemented that concept which was only a diagram and used a piano hinge and magnets to keep it closed instead of a latch mechanism. Here’s what I did to hide a Miracle Switch with charging ports for my LiFe batteries. 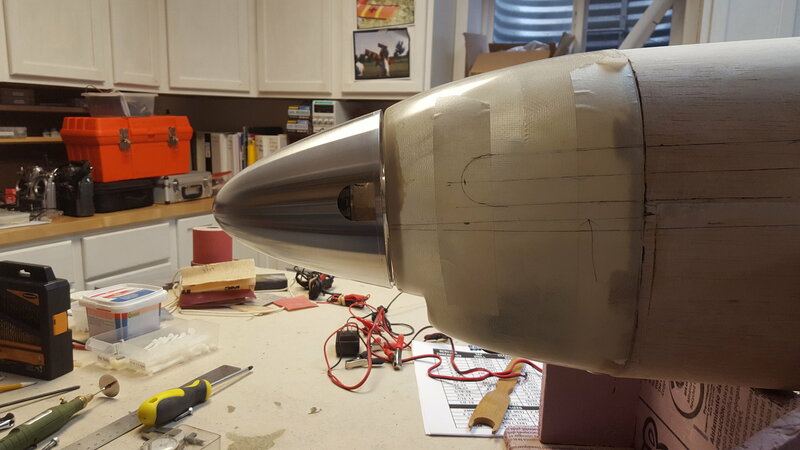 I picked a location where it was easy to cut through the fuselage and to hold the switch box that I would make. 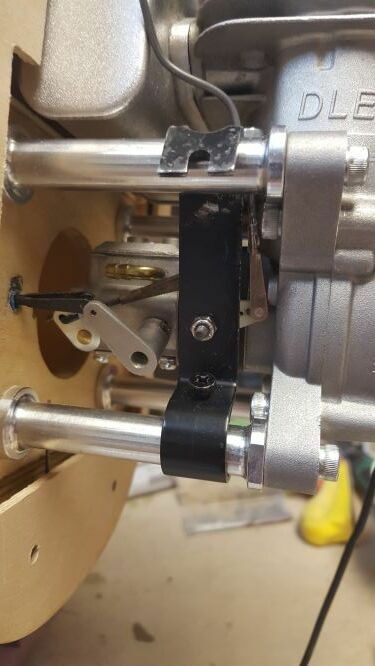 I made sure the switch box would sit on the motor mount box that I made for my motor mount. You’d have to go back to post #4 to see how I mounted the engine. 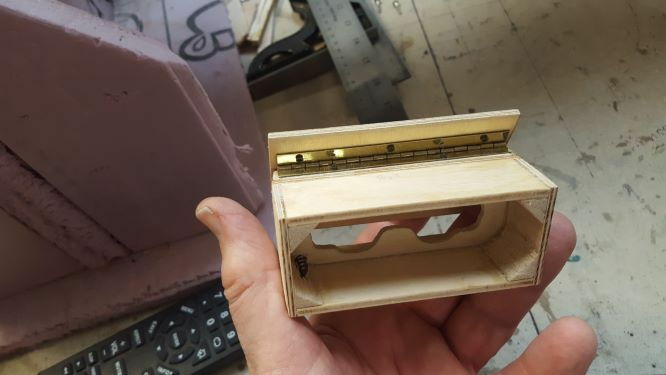 The switch box is made out of 1/8” plywood and is roughly 3 ½” by 1 ¼”. I built the 4 sides supporting them with triangle stock. I then sized a plate. I first hogged out and fitted the switch. 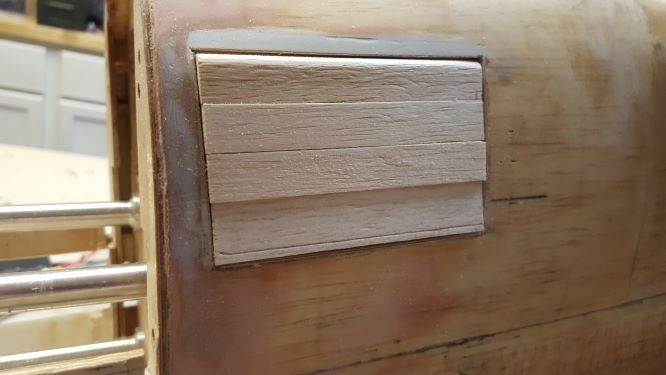 I glued the plate to the edge of the box. 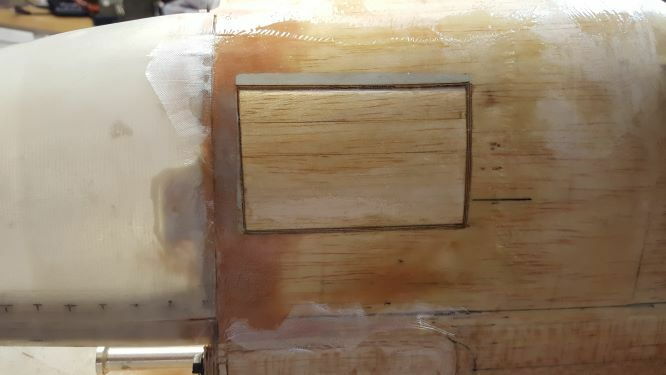 When the epoxy set and after sanding the box square, I used a band saw to cut the box in two pieces allowing enough clearance to recess the switch, about ½”. 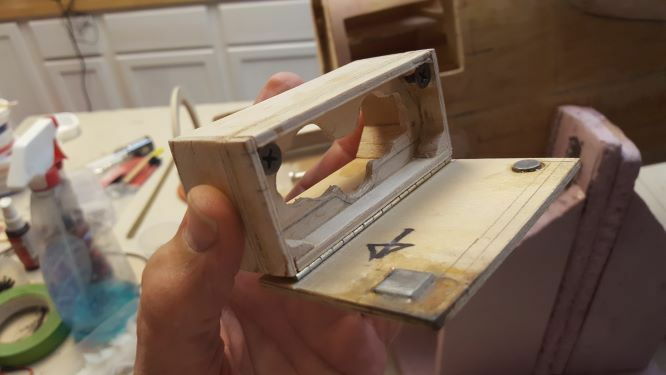 I then glued the cut off piece onto the back of the plywood plate to rejoin the box. This seemed easier to me than making two independent boxes, but that’s up to you if you copy this. The door is offset about ½” which was just a guess on how much push I would need to open. 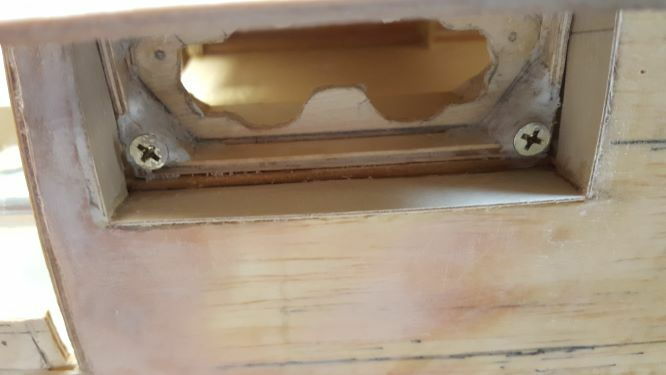 You have to watch out for the way the piano hinge rotates and also drill extra holes to offset the tiny screw heads from hitting each other. Here’s where I thought of using large steel flathead screws instead of opposing magnets. One wasn’t strong enough so I placed in a second magnet and wood screw. Later I found out how that really turned out to be a good idea and helped me which I will explain later. I checked for fit into the fuselage. 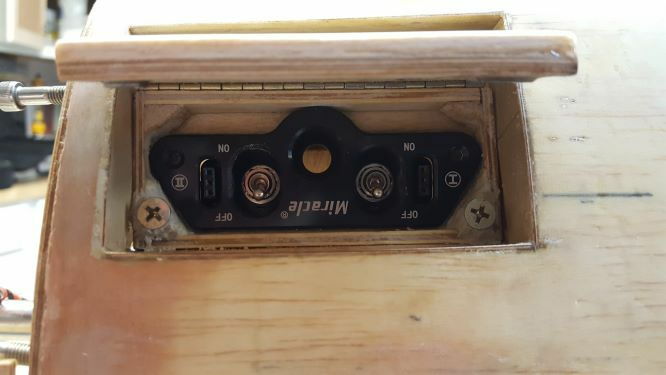 I had to cut out some of a shelf I installed earlier and I mounted the switch box securely with epoxy. 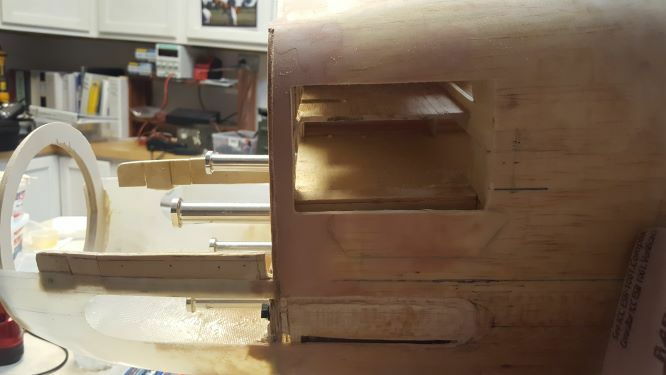 There were large gaps around the edges so I installed 1/32” plywood strips to form a clean and solid frame that fit to the hatch door. 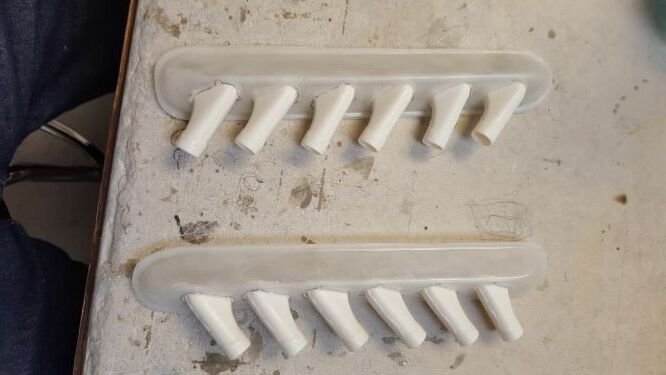 I used some of the putty to stabilize the long screws I used. Here is where the screws work out nicely. The door was uneven with the outside of the fuse. 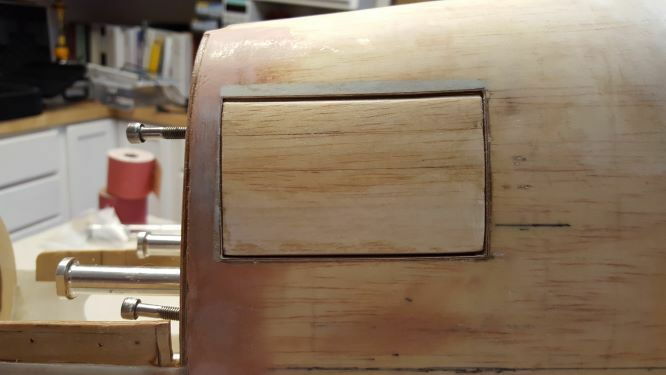 I was able to adjust the screws out till the door was fairly parallel to the fuselage. This was a chance happening. I wish I could claim I thought about this in advance, but this technique really minimized the filler I would need to make the door flush with the fuselage. 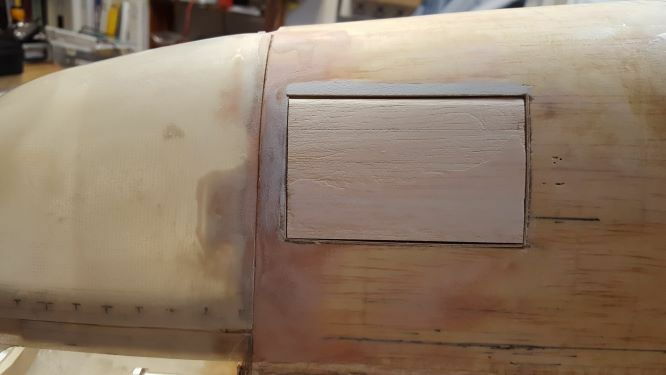 I spackled any low spots before glassing the door to make it a hard surface. 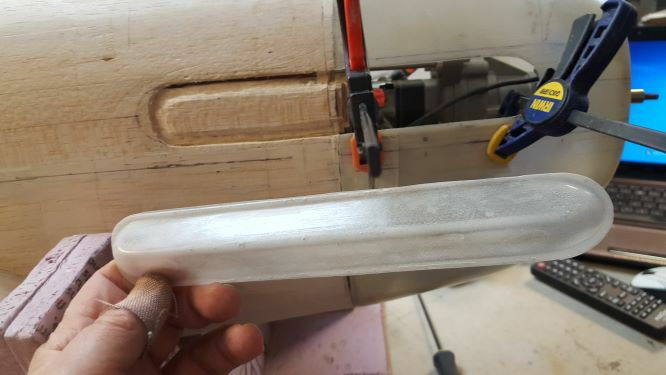 I tried to make the door and fuselage gap as small as possible, but note that the larger gap at the top (actually will be at the bottom) which had to be rounded slightly to allow rotation. The door shuts nice and solid and is easy to open. Overall I think it’s a good concept. I like the idea of not having a latch. This looks more scale even though it will mess up the panel lines. Again, "Pseudo Scale." I wish I could find that post again to give credit to the poster. Prekin, The piano hinges are readily available from Doll House manufacturers or from Meister Scale. They are 7 mm. Regarding the choke, I knew I wanted to install a manual choke out the bottom of the cowl. I needed to model a 90 degree bell crank and push rod system. I scrounged the shop for parts and I modeled one, but even though it worked, it looked terrible. I had to find something else. 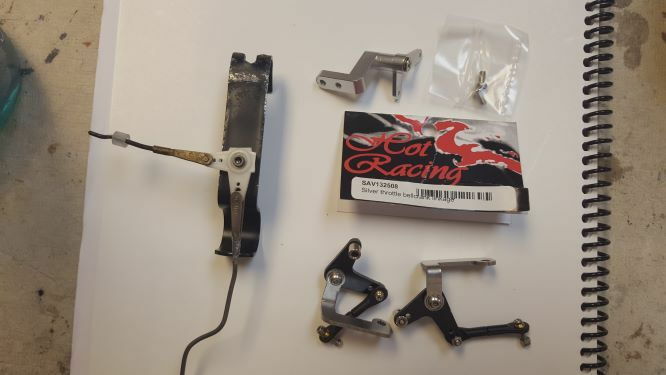 I searched the internet and found bell cranks in the RC Car world. Two looked really good for fit so I ordered them . 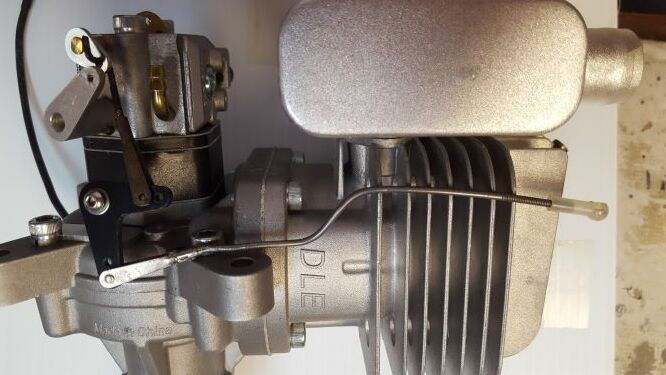 After trying different install locations, and taking one pair apart, I was able to determine that my #1 choice would fit nicely on the engine using one of the lower housing bolts on the DLE 55. 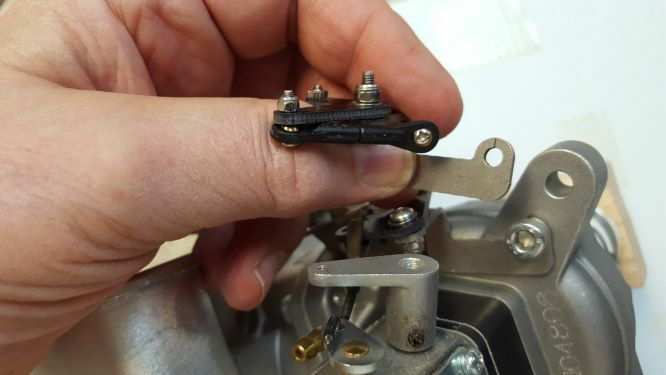 All I had to do was drill out the mounting hole of the crank 0.193.” A pair cost $13.00. This made a very nice looking and solid push-pull manual choke. It almost looks like it was engineered for it. Last edited by szempruw; Yesterday at 08:42 AM.